Partly cloudy early followed by cloudy skies overnight. A stray shower or thunderstorm is possible. Low around 45F. Winds light and variable.. Partly cloudy early followed by cloudy skies overnight. A stray shower or thunderstorm is possible. Low around 45F. Winds light and variable. 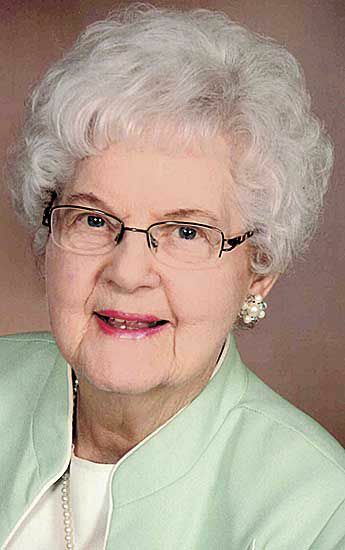 Lorraine Mae Lau of Hudson and formerly of St. Croix Falls died peacefully Jan. 5, 2019, at Christian Community Home in Hudson. She was 91. Lorraine was born July 21, 1927, on the home farm in Alden Township just south of Nye to parents Frank and Anna Hjelle. She was baptized, confirmed and later married at West Immanuel Lutheran Church east of Osceola. She attended grade school at Meadowview School and graduated from Osceola High School in 1945. After graduation, Lorraine moved in with friends of the family who lived in St. Paul, Minn., where she spent nine months learning the skills to be a beautician. She would live and go to work the next four years in this St. Paul location cutting and styling hair at a beauty salon. During her occasional trips home she would visit and attend some of the local dances with her brothers and sister. On June 10, 1950, Lorraine married Elmer H. Lau at West Immanuel Lutheran Church in a beautiful candlelight wedding. Their marriage would be blessed with two children, Janeen and Randy, and they would eventually celebrate their 65th anniversary in 2015. They lived with Lorraine’s parents as Elmer farmed the Hjelle place until health issues forced him to give up farming. In 1959 Elmer started a career at 3M in Maplewood, Minn., and the family moved to Woodbury, Minn., where they stayed until 1971. In 1971 the family moved to Hudson. Lorraine thoroughly enjoyed her role as a homemaker and mother. She was a very good cook and could sew or mend almost anything. Many delicious meals and desserts were always enjoyed at the various family gatherings. But, as most would attest to, she loved to clean and always kept the house in good order. Lorraine liked to grow various types of flowers throughout her life, especially during their gardening days while living on five acres just east of Hudson. She always had treats on hand for visitors and often supplied family and friends with homegrown fruits or vegetables that she froze or canned. Every fall we would always look forward to the annual event of lefse making. Lorraine knew how to make great lefse and if we were fortunate there would be enough lefse to last for our Thanksgiving and Christmas meals, after supplying a few dozen rounds for the annual Lutefisk Dinner at West Immanuel. Thankfully Lorraine passed along the art of lefse making to the next two generations. Lorraine was an active member of Bethel Lutheran Church during their 26 years in Hudson. When they moved to their place on Sand Lake in 1997 she continued to attend and participate at West Immanuel Lutheran Church and considered this her home church right up until her passing. She was preceded in death by her husband Elmer; brothers Ferdie and Morris, and her dear sister Olga Adam; brothers-in-law Emmett Adam, Ralph Berg, John Goberville, Bill Beattie and Robert Lau; sisters-in-law Joyce Hjelle, Ruth Hjelle and Harriet Lau. Lorraine will remain in the hearts of her loving family; daughter Janeen ( Greg Larson), Troy, Mont. ; son Randy ( Mary), Hudson; grandchildren Lisa (Brett) Poston, Omaha, Neb. ; Scott (Rebecca) Larson, Longmont, Colo.; Timothy ( Heather) Lau, Edwards , Calif.; Maren (Josh) Luedtke, Hudson; and Kariann (Travis) Ruff, Clarkston, Wash. Also great- grandchildren, Sawyer and Sloane Poston, Jacob Larson, Avery, Jack and Emily Lau, Aubrey and Brooke Luedtke, Adelynn and Elena Ruff; and sisters-in-law Carol Berg and Bernice Beattie. Funeral service will be at 11 a.m. Jan. 12 at West Immanuel Lutheran Church, Osceola, with a visitation one hour prior to the service. Interment at West Immanuel Cemetery. Arrangements by the Grandstrand Funeral Home, Osceola, Wisconsin. Condolences may be expressed online at www.grandstrandfh.com.